Occasionally I remember that this was originally intended to be a knitting blog, and even more rarely I remember to post things like “Work In Progress Wednesday” or “Finish It Up Friday”. (I still have yet to catch on to the “Throwback Thursday” photo trend on Facebook.) Truthfully there are so many works in progress around here it’s not even funny, and I’m trying to force myself into finishing something – mainly because I have friends and coworkers expecting babies over the next few months and the baby gift pile needs replenishing. 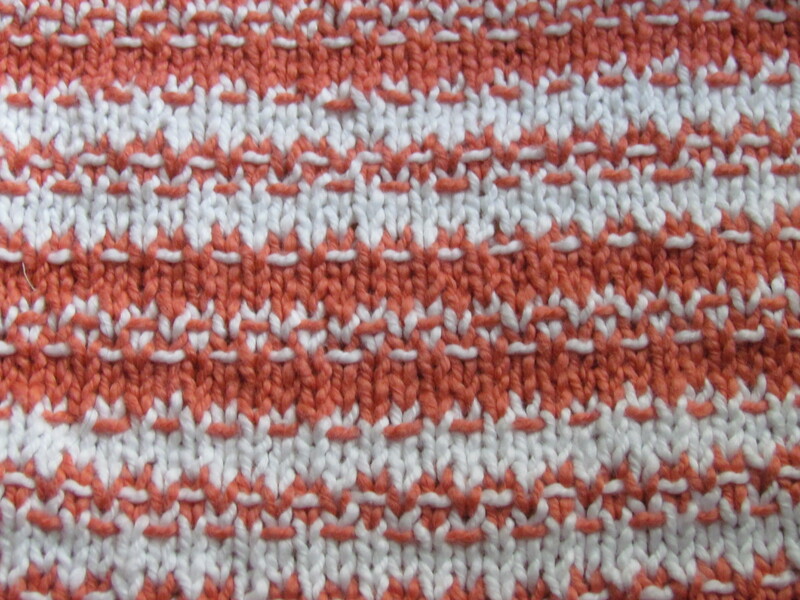 This is, or will be, a Maine Woven baby blanket (pattern here). I can tell you I started this over a year ago, and I know that because I started knitting it when we found out E’s friends were expecting a baby girl. That baby turned one back in June. (I don’t feel too badly, she got a quilt instead). And even though the end is finally in sight, I cannot seem to finish it. I assume this is called the Maine Woven Baby Blanket because the pattern called for Swan’s Island yarn, which is spun and dyed in my Homeland. However, as much as I loved the Swan’s Island yarn even *I* could not justify spending $128 on yarn to make a blanket that will inevitably be thrown up on (or worse). 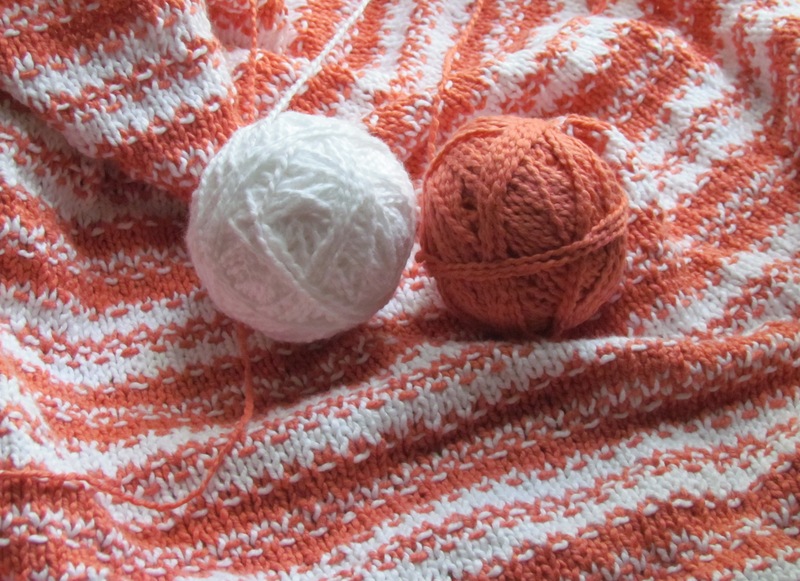 So, I opted to knit it in Seedling by Classic Elite, an organic worsted cotton, in Summer Cloud (the white) and Persimmon (which I think is now discontinued). I do worry slightly that the texture of the cotton yarn wasn’t the best choice for this pattern’s slipped stitches, but at the same time the fabric feels nice against one’s skin — substantial, but cool to the touch. (Cue Zooey Deschanel singing the Cotton song.) Twenty more rows to go!